Jeff & Bill Birnn (pronounced "Burn") have an ironclad bond. It's one that's developed through brotherhood, chocolate and an understanding of relationships -- even when they include cows. As third generation confectioners, they've transformed their family's business from 11 retail stores to an exclusive manufacturer of premium, wholesale truffles. One of the most important ingredients to their success is using fresh, heavy cream from Vermont cows, and gently blending it into the truffle's ganache center. 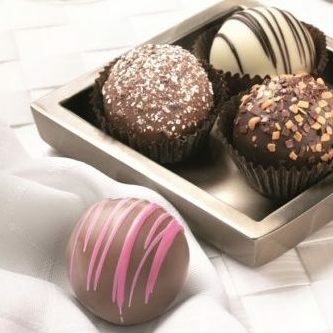 Birnn Chocolates of Vermont offers over 100 different truffles to retailers nationwide, including Bumblebee Blooms. We always make sure that when someone spots one of Bearington’s designs, they know, “It MUST be a Bearington!” The soft, friendly look makes it easy to distinguish a Bearington design from any other. The extreme detail that is put into completing each design results in the most adorable creations out there. 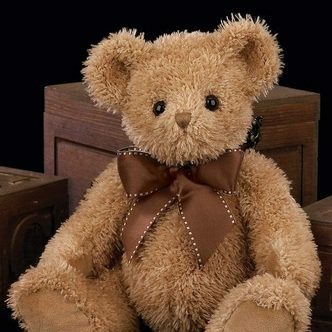 Many of Bearington’s designs are whimsical representations of life as seen through the eyes of the designers. A high-quality, natural personal care line that is affordable to everyone…hence, the compact, concentrated and convenient sizes; just high quality, good for you, unpretentious, easy to carry products! “All of the good stuff… 70% organic skin conditioning lotion and moisturizer for hand and body. Shampoo & Conditioner with honey and spirulina. Triple milled oatmeal soap with saponified beeswax and guar gum. 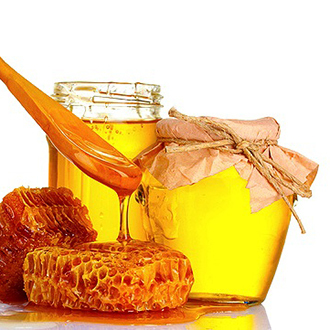 Organic olive oil, honey and beeswax lip balm. …none of the bad stuff.” Paraben-Free, No propylene glycol or mineral oil, No dyes or pigment, No lauryl or laureth sulfate, Absolutely NO animal testing… ever. 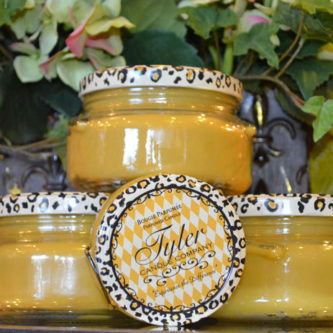 The Tyler Candle Company’s special blend of soy and paraffin wax has produced one of the finest candles on the market. Each candle is hand-poured, ensuring even burning and maximum fragrance saturation. 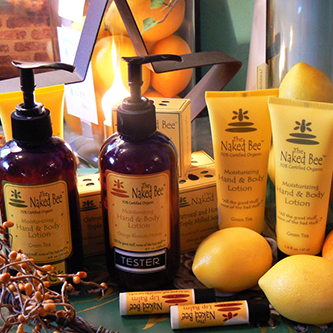 Tyler is one of Bumblebees top selling product lines! The truly stunning Torchier candles feature lifelike patented moving flame technology that mimics the look and movement of real candlelight without the worry of an open flame. 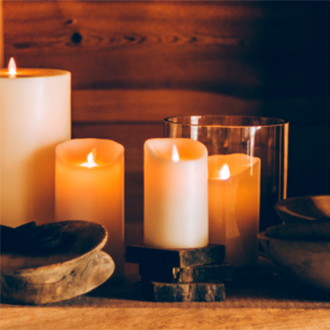 With the Aqua Flame Candles, enjoy the warm glow of candlelight combined with the soothing sound of bubbling water. The wax candle that combines a flameless candle with a bubbling fountain is the latest innovation in flameless candle technology from Bethlehem Lights. 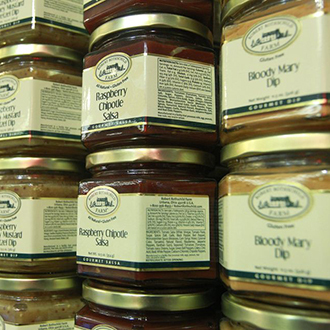 At Robert Rothschild Farm, they’ve spent over 30 years studying, refining, and perfecting the way they make fresh, insanely flavorful, truly exceptional products. Each one is made from scratch and guaranteed to make even the everyday taste like gourmet. Their products are manufactured on-site where they are able to maintain the highest quality products by producing in small batches. In addition, the majority of their products are certified kosher by Rabbi Aryeh Spero. They also offer a large variety of gluten free and organic Non-GMO products. Fed up with the lack of natural bathroom odor solutions, the owners decided to get off their hiney and do something about it! Combining their knowledge of essential oils and entrepreneurial passion, they formulated Poo~Pourri as the first natural, truly effective solution to a universal problem: poop happens, and it stinks! 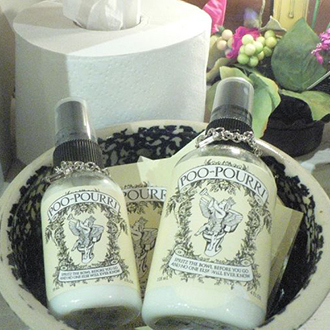 Poo~Pourri transforms your bathroom experience (and those who come in after you) by stopping bathroom odor before it begins…seriously! 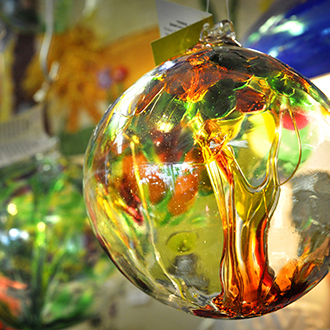 It is the vision of Kitras Art Glass to be recognized as an excellent Canadian glass blowing studio that produces innovative, beautiful and decorative glass objects. They strive to create designs that enhance the modern home, garden and lifestyle. They believe that beautiful things enhance the enjoyment of everyday life, when surrounded by beauty the spirit is uplifted. We at Bumblebee Blooms hope that you will be inspired by their products, vision and passion and share their message in your own home and with friends. 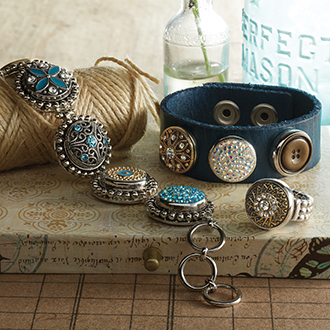 Ginger Snaps is a new style of interchangeable jewelry that features “fashion snaps,” button-like charms you snap in and out of stylish bracelets, rings and more. Ginger Snaps is all about heart and soul, sweetness and sass, and brazen individuality. Bumblebee Blooms is proud to have the opportunity to offer Art Hearts by DEMDACO Artists. 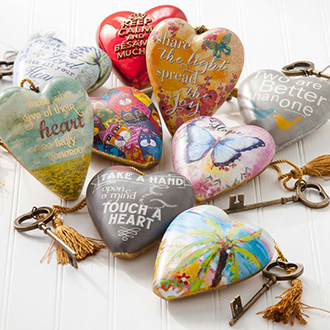 These Art Hearts offer thoughtful gifts that lift the human spirit and connect people in meaningful ways. So much more than simple decorations and accessories, these artistic pieces celebrate your diverse lives and express your unique personalities, while treasuring the memories you make. Elmwood Inn Fine Teas sprang from the success of the Elmwood Inn Tea Room and developed into having the international reputation as one of America's favorite locations for a traditional afternoon tea, becoming the first American venue to be included in the prestigious GUIDE TO BEST TEA PLACES, published annually by The Guild of British Tea Rooms. They are dedicated to pouring out the wisdom of tea with the goal to explore the world in search of extraordinary teas, to honor and respect the source of those teas, and to make those teas available to you. 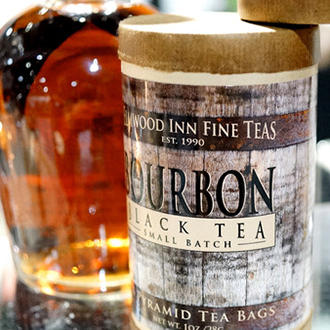 Albert Braswell always insisted that any product that had his name on the label had to be made from pure, all-natural ingredients and hand stirred in small batches. His mother never had a recipe that made five hundred gallons of anything, so changing things for the sake of efficiency never interested him. Make it as close to homemade as possible and never, ever cut corners, is the formula for success that generations of customers expect. 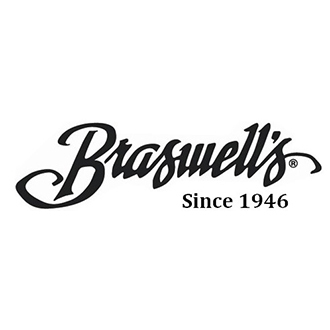 Whether you choose from their reusable glassware that the Braswell's Select Line offers, or one of the dozens of traditional Braswell's collection, you are going to savor the absolute best that their kitchen can create for you. Using Milos’s love of vintage graphics and classic Americana, he and Trixie learned how to laminate Milo's designs onto stainless steel flasks, and then they took their new products on the road. The flasks were an immediate hit! 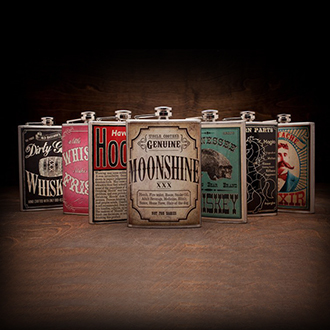 It seemed that everybody wanted a cool vintage style flask which is finished by hand in their studio. The husband and wife design team produce unique and fun designs and all designs and artworks are unique original creations. See something you want from one of our vendors? If we don't have it we'll try and order it for you! Remember we can deliver it all to the greater Reno/Sparks Area! © 2019 Bumblebee Blooms Flower Boutique. Theme by XtremelySocial.